I have made this website to serve as a mountaineering and climbing journal, as a planning resource for others, and as a medium for sharing my photographs. Please feel free to contact me if you have any questions or comments! 6230m Pik Chetyreh, “Four’s Peak”, is an aesthetically pleasing mountain nearby the Moskvina basecamp of Pik Korzhenevskaya and Pik Kommunizma. I climbed Pik Chetyreh with two partners as an acclimation warmup. 5947m Alpamayo is one of Peru’s most famous and popular climbs. A perfect snow pyramid when viewed from the north, an imposing fin of ice from the southwest, Alpamayo is considered by many to be the most beautiful mountain in the world. 5643m Mount Elbrus is the highest mountain in Europe. Located in southern Russia within the Caucasus mountain range, Elbrus is a dormant volcano and a non-technical climb. I climbed Elbrus via the standard southern route. 5484m Camel Peak (骆驼峰), so named for its twin summits’ resemblance to a camel’s back, stands at the northern end of the Changping Valley (长坪沟) nearby China’s Four Sisters Mountains/Siguniang Shan (四姑娘山). I made a solo winter ascent of Camel Peak West with a supported approach via the Changping Valley. 4096m Mount Kinabalu is Malaysia’s highest mountain. Kinabalu is an accessible trekking peak famous for its sunrises, spectacular clouds, and the many interesting rock formations found on the upper mountain. 6032m Tocllaraju is one of several sharp, stunning ice pyramids which pierce the skyline of Peru’s Cordillera Blanca. Tocclaraju presented a technical, aesthetic, physically challenging, and very rewarding climb. 5460m Yanapaccha is one of Peru’s lesser known mountains, likely due to it’s relatively low altitude and greater difficulty when compared to nearby Pisco. Despite this, Yanapaccha offers a highly accessible yet technical climb with incredible summit views of surrounding peaks and valleys. 5752m Pisco West is one of Peru’s most popular climbs on account of its ease of access and low technical grade. Despite being an easy climb Pisco offers one of Peru’s most beautiful summit panoramas due to its central location within the Cordillera Blanca. 5530m Ishinca is an accessible trekking peak located nearby Tocllaraju in the Ishinca Valley. Ishinca’s simple access and gentle slopes make it a perfect acclimation peak. At 6962m Aconcagua is South America’s highest mountain and the highest peak outside of Asia. I climbed Aconcagua solo, spending a total of 14 days in the national park and reaching the summit on my 11th day. A brief overview of the route, summary of my itinerary in Argentina, and a detailed trip report. Photographs from my solo Aconcagua climb, organized by date. 6438m Illimani is Bolivia’s second highest mountain, enormous and beautiful, hovering over nearby La Paz. I made an overnight climb of Illimani’s south summit and highpoint. 6088m Huayna Potosi is easily accessed from nearby La Paz. 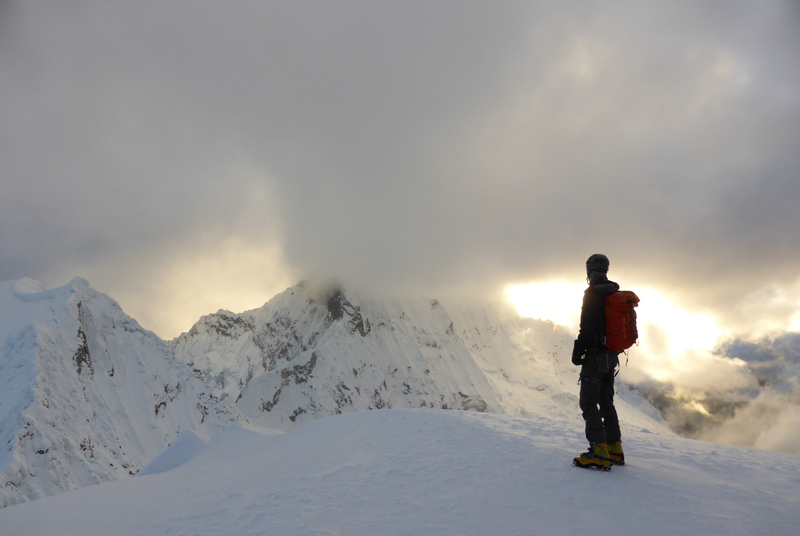 A fast and light overnight ascent and excellent summit views made for an exciting climb. 5370m Pequeño Alpamayo, part of the Condoriri group of peaks, is one of Bolivia’s most popular due to its elegant appearance and aesthetic standard route. 5636m Pico de Orizaba is the highest mountain in Mexico, and the third highest in North America. I climbed the north route up Orizaba over two days, with perfect weather and great conditions on the Jamapa glacier. 5230m Iztaccihuatl is Mexico’s third highest mountain. I hiked Iztaccihuatl over three days as acclimatization for Pico de Orizaba, but its great views made it a worthwhile hike in its own right.